NYCFC's Jack Harrison gets a step on Columbus' Justin Meram. USA Today Sports. 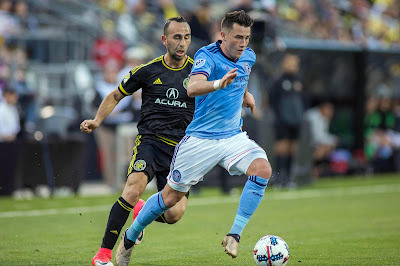 New York City Football Club got a big win in Columbus, 3-2, over the Crew on Saturday night, as Jack Harrison led the way with two goals. Harrison's first goal came in the eighth minute on a brilliant feed from Maxi Morales, who earned his fourth assist of the season. Columbus tied it in the 29th minute on a goal from Federico Higuain, and took the lead in the 49th on one from Ola Kamara. NYCFC tied it in the 64th minute when Yangel Herrera scored on a feed from Ben Sweat and Alexander Ring. Harrison got the winner in the 76th minute on a feed from Herrera, who stole it from a Columbus defender to get the play going. It was Harrison's fourth goal of the season. NYCFC won this one without their captain David Villa and they improved to 4-3-1, with 14 points, on the season. New York City FC Head Coach Patrick Vieira said of the win, "It was a big result for us. I think we had a really good game plan, and coming in here against a really good side and managing to go back to New York with three points is really big for us." Vieira said of Harrison’s performance, "I think Jack had a fantastic game. I think when you come to a place like that, and play the way that we played you need players to be at their best. When you look at Jack, he was fantastic not just because of the goals he scored, but the way he worked for the team." On asking more of Harrison, Vieira said, "I think Jack grew up as a player. He’s getting better every day, every week because of the way he is training. He’s working hard with [David] Villa every day. Of course that’s a great result, he wants to play every week and he’s working really hard in training. When he has the opportunity, he shows me how good he is." Harrison said of his team’s victory, "I thought it was a good team performance; we played very well to get the goals. We did very well to come back from losing and it think it was just a well-done team performance." On his brace, Harrison said, "The first goal, we were on the counter-attack, [Maximiliano Moralez] had come over to the right-hand side and made a run in behind and played a perfect ball, and I just managed to chip it over the keeper. The second one was great team pressure. We pressed very well, [Yangel Herrera] was able to touch the ball away from the defender and I just managed to get there before someone else was behind me and just slide it in the back of the net."